Clicking on the links and purchasing through them for our affiliate accounts at B&H Photo Video, SmallRig or Think Tank Photo helps us continue our work for ‘Untitled’. “We put a spotlight on these acclaimed Australian technicians – including their career highlights and how they shot them – as part of International Women’s Day. To gain accreditation from the Australian Cinematographers Society (ACS) is no mean feat. It requires a minimum number of years working within the industry and a body of work which represents not just that you can do the job, but with a level of creativity and innovation that exceeds the norm. A sub-committee then assesses the work and from there you may be awarded your ‘letters’ – the ACS that appears after your name. 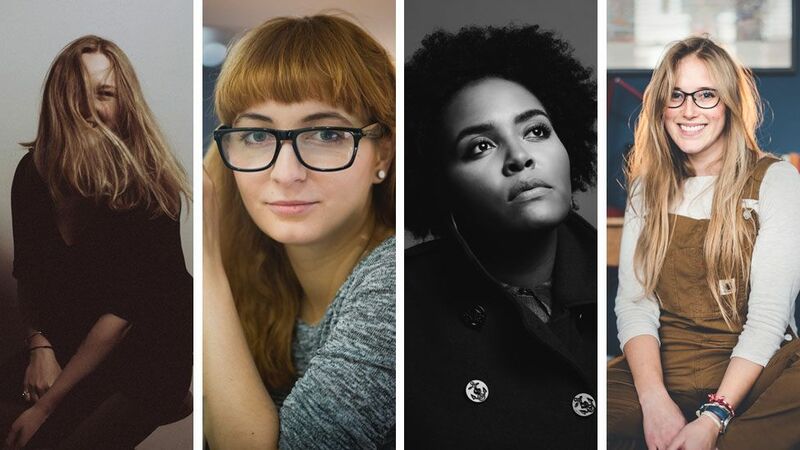 “Photographers Jennifer McCord, Iulia David, Holly-Marie Cato and Amy Shore are leading the charge to get more women behind the lens. They will be passing on their knowledge at the Women Who Photo event to be held at The Photography Show in Birmingham. “Push-ups and photography aren’t normal bed partners. But when Cybele Malinowski was starting out as a young photography assistant in 2005, she was told to do 100 push-ups a day. The reason? To “match the strength of a man”…. … As her career gathered pace, Malinowski battled discrimination beyond heavy gear. Often when she arrived on set, the client would assume that her male assistant was the photographer, or that she was the makeup artist or stylist. More recently, when she became pregnant, Malinowski suddenly found herself losing jobs: clients told her they feared she just wasn’t “up to it”…. … Trying to get sexism off the couch has become Malinowski’s mission. Last year she co-founded Agender, a platform for female photographers designed to exchange ideas and advance careers, with the former investment banker turned entrepreneur Angela Liang. Their second annual exhibition, Balance for Better, will open on 9 March to mark International Women’s Day, with 50% of sale profits donated to Sydney Women’s Fund. “Want to spend International Women’s Day with your BFFs, taking in some ~art~ and toasting to female empowerment? If you’re in Sydney you’re in luck, because an exciting new (free) exhibition filled with work by local female artists is opening this week and running for the whole of March. “…the larger task remains to engineer a genuine culture shift at the grassroots of the arts; to adequately support artist wellbeing in a competitive and under-funded sector. Real culture change doesn’t come cheap. It takes money, time and resources and on that front, Australia is a long way from Hollywood. This has, alas, all come about a bit too late. “…Women continue to be underrepresented in the photography industry – can you tell us about the Loud and Luminous project and how it attempts to address the imbalance? Loud and Luminous is a project that celebrates Australian women photographers. Our mission is to inspire and empower women and girls.